Carlinville's annual Route 66 Car Show and Cruise In was held Saturday, July 26, on the historic square in Carlinville. There was a good crowd, numerous car entries, vendors both outside on the square and indoors in the K.C. Hall, tours of the Million Dollar Courthouse, great fish sandwiches, and more than enough heat and humidity. 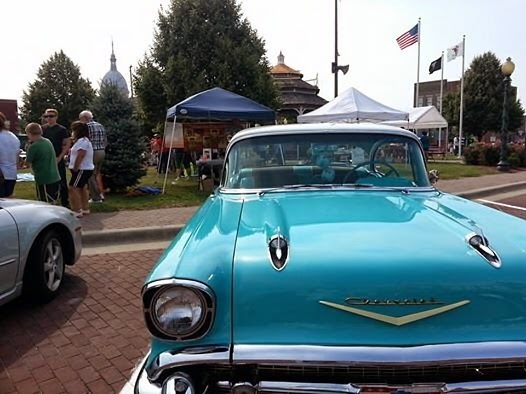 My co-author Joe Sonderman and I set up our book booth on the square (in a nice spot next to the friendly Carlinville Chamber of Commerce folks) with Joe's beautiful '57 Chevy Bel-Air parked right in front of us. Our book booth on the square behind the Chevy, and the Million Dollar Courthouse visible in the background. At 11:30, a ceremony was held commemorating 90 years since the Ariston Cafe was first established in Carlinville. 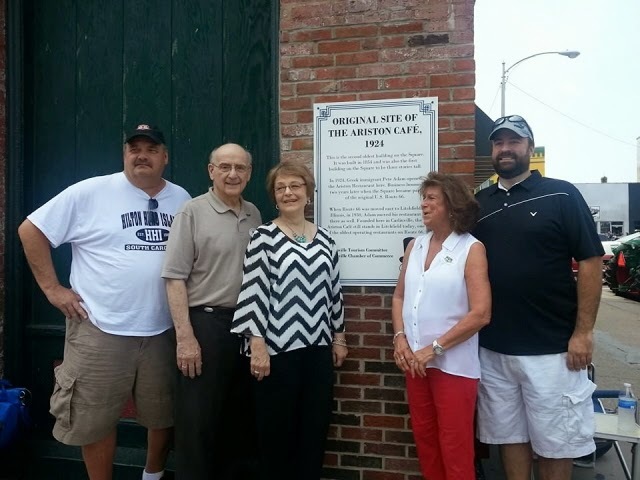 A plaque at the corner of the historic building was unveiled. The second and third generations of the Adam family, Ariston owners/operators, were on hand for the occasion. The building on the historic Carlinville Square is now home to Lucky Dog Alehouse. Left to right, Illinois Route 66 Scenic Byway Director Bill Kelly, Ariston owner-operators Nick and Demi Adam, Mayor Deanna DeMuzio, Lucky Dog Alehouse owner Jimmy Snyder. Tractors on display in front of the original 1924 location of the Ariston Cafe, now Lucky Dog Alehouse. Greek immigrant Pete Adam established the Ariston in Carlinville in 1924. Route 66 was re-routed through Litchfield a few years later, leaving Carlinville high and dry without a national route. The Adam family and the Ariston moved on to Litchfield. At first the restaurant occupied a building just across the road from its present location in Litchfield. When the new (present) building was constructed, it faced Route 66. When the new alignment of 66 opened in 1940 behind the restaurant, more signage was added to the back of the building. Carlinville has been doing a great job acknowledging its history and promoting its Route 66 heritage with a clever logo ("Where Lincoln walked and Route 66 rolled,") nifty banners hanging in the downtown area, logo t-shirts, Route 66-themed events, and leadership in the new Illinois Route 66 Blue Carpet Corridor. Go, Carlinville! One of Carlinville's nifty banners.